If you like all things fly fishing, consider joining us! Check out what we do! 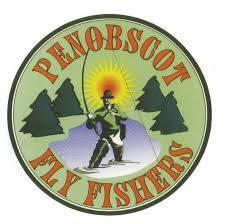 ​Penobscot Fly Fishers, locally founded in 1997, is a family-oriented fly fishing club located in the Bangor, Maine area. It is a 501(c)(3) non-profit educational organization that promotes outdoor fishing activities and conservation of our fisheries to all who enjoy recreation in the magnificent state of Maine. - you want to learn more about fly fishing. - you want to share your knowledge of fly fishing with others. - you want the winter to pass by quickly, so you need a winter activity. - you want to learn how to tie flies. - you want to learn more about fly fishing from an array of interesting speakers. - you want to be part of a like minded group that enjoys the outdoors and each other’s company. - you want to help or learn about conservation efforts. - you want to learn new fishing spots in Maine. - you want to have fun. - YOU LOVE TO FISH! We offer you the opportunity to both socialize and develop lifelong friendships with like minded individuals. Yes, we explain and instruct, we listen and learn, but most importantly - we fish! Our club activities/events, which always have an educational/conservation aspect, are an important part of who we are and what we do. Members of all different skill levels are always willing to share their knowledge and experience. Our Events Committee plans numerous fishing outings each year. All outings are open to members and guests, and often participants have the opportunity to fish on water they haven’t visited before. The Penobscot Fly Fishers also conducts fly tying classes both for beginners and advanced tyers. Classes are taught by talented club members, as well as world-class professionals including Don Bastian, Joe Calcavecchia, Ed Muzzeroll, and Dave Klausmeyer (also a club member). We meet the First Wednesday of each month from September through June (check our Calendar for actual dates). Each month we have a speaker, demonstration or some unique activity. We meet at the Penobscot County Conservation Club House in Brewer, Maine at 5:30 pm with a social period. Dinner is at 6 pm followed by a short business meeting and speaker. We wrap up by 8. The address for the Clubhouse is Penobscot Conservation Association 570 N Main St Brewer, ME 04412.